After our mediocre dinner at L’Atelier de Joël Robuchon on Friday night, I didn’t have really high expectations for our Saturday night dinner at Hutong. 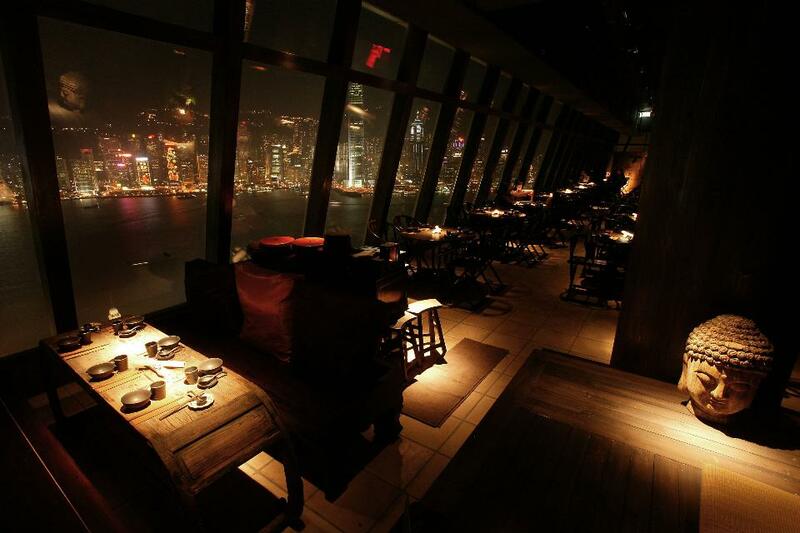 Hutong came highly recommended by 2 friends – they both loved the view and said the food was great. 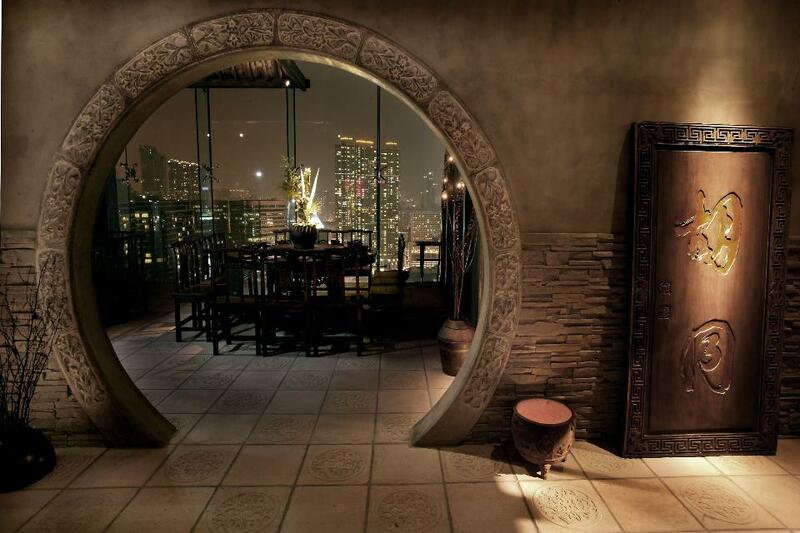 Hutong is located on the 28th Floor of One Peking Road. This 30 story sky-scraper is located in the Tsim Sha Tsui area of Kowloon on the corner of Peking Road and Canton Road, adjacent to the Peking Road Metro Station (among other Stations as well). I’ve said before, how I enjoy going to high places (buildings, hills, etc) to get a better view of the surrounding area, but I’ve never really found the food at these locations to really be worth it. If a restaurant has a great view, more often than not, you’ll hear people talk about the view and not the food. In any event, it came highly recommended so we gave it a try. We had reservations for 20h00 and we arrived about about 15 minutes early. We were told to wait off in the corner until our table was ready. About 5 minutes into our wait we were offered a wine list, but the server never returned to take our order. At exactly 20h00 we were shown to our seats. I chose this reservation time because the Symphony of Lights begins promptly at 20h00 and this restaurant is designed to highlight this spectacular light show. The Symphony of Lights is a daily phenomenon in Hong Kong, organized by the Tourism Board to showcase the beauty of the Hong Kong Architecture and natural surroundings. This light show is timed to accompanying music that was piped into the restaurant as well as various viewpoints around the harbor. It was a bit cloudy when we were there, so my photos are pretty much crap – but if you Google the “Symphony of Lights – Hong Kong”, you’ll see what I’m talking about. The show lasts for 14 minutes. The show started as we were being seated at our table and the servers kept away for the entire light show. It was nice that they weren’t in our way or disrupting other patrons pictures, although, I would have enjoyed a drink during the show. Unfortunately, I didn’t bring my camera to dinner this evening, so all my pictures are just awful – my phone didn’t do the venue justice. All the photos I’m including herein are the official photos from the Hutong website. To watch the light show we were seated on the same side of the table. When we sat down, I didn’t even realize that both place settings were on the same side, I instinctively sat across from my friend and everyone around me had a good laugh. We decided to order family style and started with the abalone carpaccio. This was my first time eating abalone – I honestly didn’t realize it was a sea snail – when I read abalone on the menu, I thought “abacore” – a tuna species. The abalone was very good – served very clean, just with a bit of green onion oil. We then had the thick cut pork belly which was served with cucumber and a garlic sauce. I thought this pork belly was great – sometimes I find pork belly just to be a big wad of fried pork fat, with very little meat and little enhancements to the flavor. This was a nice mix of fat and meat and a great flavor. Next up, we had the Kung Po Style Chili Prawns. Of this dish, all I remember is the cashews that came with it. Not a winning endorsement, I know. For our main, we had the crispy duck, which was sliced and served with another green onion sauce and Chinese pancakes. The duck was my favorite item on the menu. We had a nice Bordeaux wine with this dinner – I couldn’t stray from the French theme we’d been sticking with so far on this trip. When we were finishing up our meal, there was another show – this time inside the restaurant. The chef entered the dining room and provided a demonstration on how to make Chinese noodles. The music turned up and he began flinging the dough around, rolling it, stretching it and within 5-7 minutes he went from one large ball of dough to dozens of feet of thin noodles. It was great to watch, except that everyone was pushing trying to get the best picture of the spectacle. I was interested in watching – and enjoying my wine, not taking the best action shot in history. My expectations were low. The service was a bit shoddy. The food was very good and the two shows (light show and noodle show) were both quite enjoyable. I would recommend that first time visitors head on up to Hutong for the shows and a meal. It is definitely designed for tourists, but the food wasn’t of standard tourist quality. While I don’t think I’d go back on my own for a meal here, if I were traveling with a Hong Kong virgin, I would return to show them the spectacle. My body clock was all messed up on this trip, so the first night I slept about 3 hours and was awake from 05h00 on – showered and ready to hit the town by 06h00. The night before, we planned on meeting at 08h00 for breakfast, then head into the City and see Victoria Peak. No matter where I go, I want to go to the highest spot and just look around. I’ve done it in Cape Town, Paris, Shanghai and I always make visitors to Chicago do the same. After breakfast and just missing the complimentary shuttle at the hotel, we hopped in a cab and headed to Central Station. From there we wandered aimlessly around the shopping mall, trying to find the best door to exit – dropping us off as close as possible to the Peak Tram. Once we made it outside (the wrong door, of course) we realized the signs were pretty clear on how to get to the tram. We walked up a bit of a hill (huge hill for a flatlander Chicagoan, like myself) and stumbled across St. John’s Cathedral – which warranted a quick stop. I dig the Gothic arches and the colonial vibe of the fans in this Cathedral. We spent a few minutes walking around – I always take time to sit in the center pew and just be. I’m not religious, but I do dig the history. I think about the building of this structure, the people who toiled in it’s construction, the people who eagerly awaited it’s opening, the children who begrudgingly sat their listening to the priest yearning to go out and play – where are those kids now? Do they do the same thing to their kids? We then walked over to the Peak Tram Terminus where I attempted to buy two round trip tickets with observatory access. I say attempted to, but something was lost in translation — we were sold a one way ticket. We waited for the Tram and were surrounded by a surprisingly large number of Americans. I was a bit shocked. I was also shocked that the largest advertisement in this tram station was for the American chain Bubba Gump Shrimp. The large group of Americans around us talked constantly about how great Bugga Gump is and how they can’t wait until they get back from the Peak and can go their for lunch. Let’s just say we did not have the same conversation nor the same plans for lunch. Once atop the mountain you disembark and then walk through a shopping mall (for some reason) to get to the observation deck (this is where we found out we didn’t have the full access ticket). We grabbed the audio guide, which I usually stay away from these because more often than not they go through painstaking details and I don’t have the patience or the time to listen. This time was different – my first visit to the City and I hoped this audio guide would give me a better lay of the land (and it did). From Victoria Peak you have nearly 360 degree view of Hong Kong. The weather was beautiful the day we went to the Peak. At the top, it was a bit windy/brisk, but the warmth of the sun made up for it. Peak Tram making its way up the mountain. We spent about an hour at the top of the Peak enjoying the views, the sun and the peacefulness of the space. Such a quiet sanctuary in the middle of a crazy busy City. I’m very happy we paid the Peak a visit – it is definitely one of those check-list items you need to do when visiting Hong Kong. That being said, I can’t imagine making this a regular stop on my visit to Hong Kong. When you visited Hong Kong did you visit the Peak? How about on subsequent visits, does it remain on the required stop list? Did you have the same issues I did with the tickets? I’m a Starwood guy. Hong Kong has a few Starwood properties including the W Hong Kong, Sheraton Hong Kong Hotel & Towers and the Le Méridien Cyberport. I always struggle with the W (anywhere in the world) – I dig them initially, but then get annoyed after a day or two after walking through the Lobby and seeing all the uber-cool people hanging out in the lobby bar/club. I’m no cool kid. The service is often aloof which can be charming initially, but after a couple of days it wears a bit thin too. That being said, I figured the W Hong Kong would be a fun place to hang out. Unfortunately the rate was running about 350USD or 20,000 Starpoints per night. A bit too rich for my blood. The next option was the Sheraton – which is just feet from my tailor’s shop. A couple friends flat out told me not to stay there. They didn’t add any details to their recommendations, but I trust them. Cross that off the list. The final option was the Le Méridien Cyberport, which is on Hong Kong Island, but isn’t on a Metro Line and is quite far from the hustle and bustle of the Hong Kong life. I did receive some very positive comments from friends about this hotel and they assured me that even though this property is off the beaten path you were still connected to the City. The rate was about 200USD or 12,000 Starpoints / night. Sold – for that rate, I’ll bite. We landed in Hong Kong about 20 minutes earlier than our scheduled arrival time, we made a quick visit to my tailor and a dinner a few blocks from his shop – after which we hopped back into a taxi and headed to the hotel. From the Sheraton it was a 20 minute taxi ride (with a fare of about 100HKD or ~12USD). The first taxi ride out here was a little disconcerting — not having any idea where we were going or how much longer we had, made me a little uncomfortable. We pulled up to the hotel around 22h30 and were greeted by lobby full of hotel employees – all with enormous smiles and very big personalities. We headed to the reception desk and before I even reached the desk, I was greeted by name. I assume, based on my check-in time, I was the only person expected that night who hadn’t already checked-in. In any event, the check-in process was quick and easy: scanned our passports, mentioned some of the hotel amenities (included Platinum breakfast, workout facilities, free wi-fi, etc). Our rooms were on the 10th floor. Our body clocks were all messed up – even though it was bed time in Hong Kong, it was morning in Chicago. We decided to drop our luggage off in our rooms then head down to the bar for a quick drink. The bar was pretty empty by the time we showed up and the service was a little spotty – I think everyone was ready to shut down and go home. We ordered a couple cocktails then around midnight headed back to the room. The rooms were very large — the property only has two suites – and my suite upgrades didn’t clear, unfortunately. Luckily we each had a king room which was very sleek and modern. There was a seating area near the large windows with a couch and a chair which got a decent amount of use, considering how little time we actually spent in the rooms. I had an ocean view room, with amazing views of all the shipping traffic coming in and out of Hong Kong. I’m a big transportation nerd and watching this traffic kept me enthralled while I was in the room…with a glass of wine of course. Opposite of the bed, there was a large desk and a moderately sized flat screen TV. The desk area is much less blurry in real life than it is in the picture. There was plenty of space to work comfortably at this desk — unfortunately I had to get a few hours of work done while on this little vacation. The bathroom was surprisingly large (hell, everything in this hotel was surprisingly large – considering the space constraints elsewhere in Hong Kong). A separate shower and a very deep tub were the focal points of the bathroom. The large vanity was topped with a glass counter top, which showed all sorts of finger prints and toothpaste stains once I was done with it – but the housekeeping service did an impeccable job of cleaning up after me. I did not take a bath — the idea of bathing in a hotel tub creeps me out (even though I did take a bath in Paris in November). The shower was HOT and the water pressure great — the issue was the drain. Before you knew it, you were ankle deep in shower run-off. Not good. I complained to the front desk both mornings I was there, but nothing came of it. At least it kept me from wasting water by taking a long shower. EAD did not have the same issue, so it doesn’t appear to be a systemic issue with the building, just my room. We at breakfast in the hotel each morning and had the buffet. I love breakfast buffets in Asia. We had the option of ordering off the menu, but both decided the buffet made the most sense. While this buffet wasn’t as fantastic as the buffet at the St. Regis Bangkok, it was moderately expansive with traditional Western options (pancakes, bacon, waffles, omelettes) and Asian fare (tons of fruit, porridge, noodle soup). I had mostly fruit, dumplings and bacon — the pork pate sandwich was pretty tasty too. If the buffet hadn’t been included as a Platinum amenity, I wouldn’t have eaten here – I’d rather just grab a pastry and some juice while out exploring the City. It was a nice way to shave off some cost of the trip. The hotel also offers a shuttle once an hour to the central train station. The complimentary shuttle takes about 15 minutes. The first day we missed the shuttle by about 10 minutes, so took a taxi into the central station. I’d recommend you plan to take the shuttle, it’ll save you a bit of money and the shuttle is more comfortable than the taxis. You can also get picked up by the shuttle at the station, but we failed to make it to the pickup point in time and ended up taking a taxi home each night. I really liked this hotel. The service was good, the rooms were (relatively) huge. Everything was clean and despite it being 7km from Central Station, I didn’t feel separated from Hong Kong – quite the opposite actually. It felt nice to be away from the busyness of the City – you could relax a bit more, but were still extremely close to all the action. I would definitely stay at this property again. My biggest complaints are that they have only two suites and that my shower drain was very slow. We are stuck with the former issue, but the latter can easily be fixed. Where do you stay when visiting Hong Kong? Do you think the Le Méridien Cyberport is too far away from the action to be worthwhile?